Mumbai’s number one Broadband and telecom service provider Mahanagar Telephone Nigam Ltd (MTNL) announced the launch of 4 New Unlimited Plans for its Broadband (Triband) subscribers in Mumbai circle. All New plans will allow True Unlimited High Speed Downloads and Uploads without any Fair Usage Policy (FUP). The USP of these New plans would be the upgraded High speed (1 Mbps and 2 Mbps) during Night Hours and on Sundays. 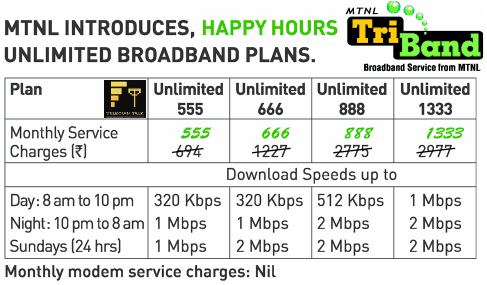 MTNL’s DSL_Unlimited_555 Plan comes at monthly rental of Rs.555 and provides Unlimited Broadband access with day time speed 320 Kbps and 1 Mbps during Night Hours and Sunday. While DSL_Unlimited_666 Plan offers Unlimited Broadband access with day time speed 320 Kbps, 1 Mbps Speed during Night Hours and 2 Mbps on Sunday. Apart from the above Unlimited plans, MTNL also introduces 2 New Limited Combo Plans (Landline + Broadband) for Higher Usage customers at monthly rental of Rs.1249 and Rs.1749 with 2 Mbps and 4 Mbps downloading speed. MTNL is only Broadband service provider in Mumbai circle which offers Truly Unlimited Broadband Plans without any Fair Usage Policy (FUP) starting from Rs. 395. 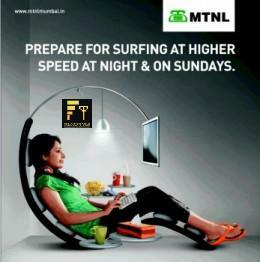 For more details on MTNL Broadband dial 1500 (toll Free from MTNL) or 022-22221500. Are the happy hours plan combo plans? Do they have 100 free calls included in 555?